It’s the CON GUY’s first-ever WONDERCON panel! Friday night, March 29, come up to room 300B and spend an hour with THE POWER RANGERS! Celebrate more than 25 years of Power Rangers with some of your favorite Power Rangers actors, including Ciara Hanna (Power Rangers MegaForce), Cameron Jebo(Power Rangers MegaForce), Brennan Mejia (Power Rangers Dino Charge), Jack Guzman (Power Rangers Wild Force), Nico Greetham (Power Rangers Ninja Steel), and William Shewfelt (Power Rangers Ninja Steel). Moderated by comedian/actor Ben Kliewer (TheConGuy.com). Don’t miss your chance to be part of the Ranger team! On Friday, during the day before our panel, don’t miss your chance to meet and get autographs and photos with the Power Rangers! They’ll be signing at BOOM! Studios, which is located at BOOTH #1301. 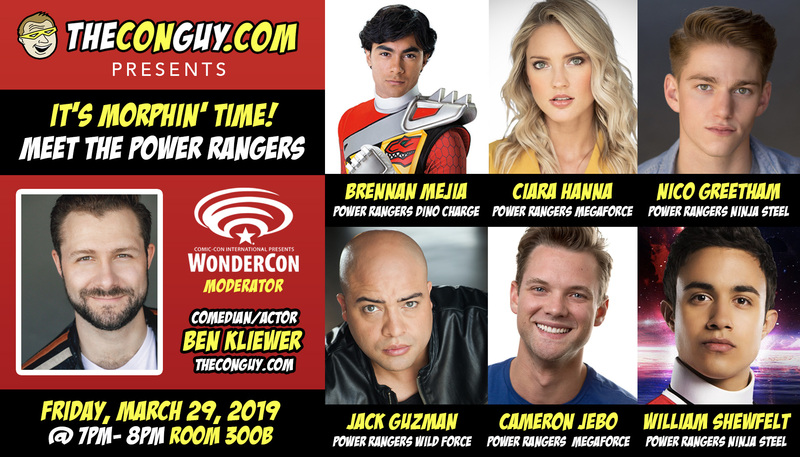 2 p.m. – 3:20 p.m.
3:30 p.m. – 4:50 p.m.
5 p.m. – 6:20 p.m.
Also, check out Ciara and Cameron here on this week’s THE CON GUY show, where we discuss Wondercon, the panel, and all kinds of cool stuff from the set of Power Rangers.